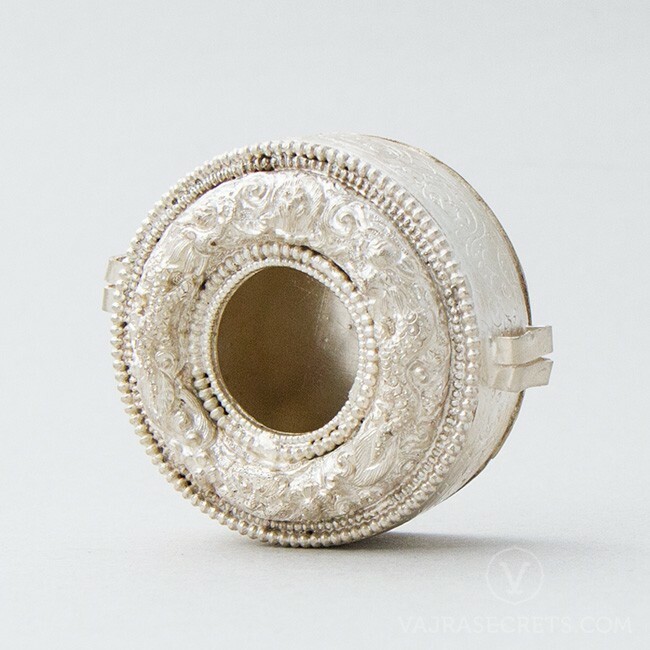 A circular Tibetan gau or prayer box, handcrafted from white metal and silver-plated by master Himalayan craftsmen. Richly carved with ornate traditional motifs, this compact fitted-back gau can be filled with small statues, tsa tsas, deity images, holy items or blessed objects, and used as a portable shrine or protective talisman. 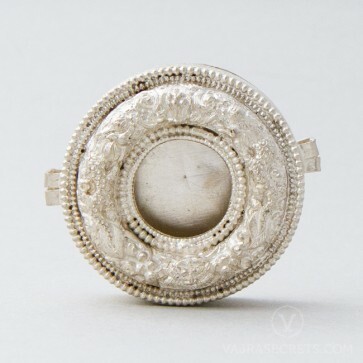 The Tibetan Gau (or Ghau) is a prayer box or amulet container traditionally used by Tibetan Buddhists as a reliquary to hold and carry sacred objects such as an image of the owners’ personal deity wrapped in silk cloth, along with other holy objects or blessed items. Gaus were traditionally kept in custom-made silk pouches and carried close to the heart by the nomadic Tibetans during their travels as a source of protection and blessings. 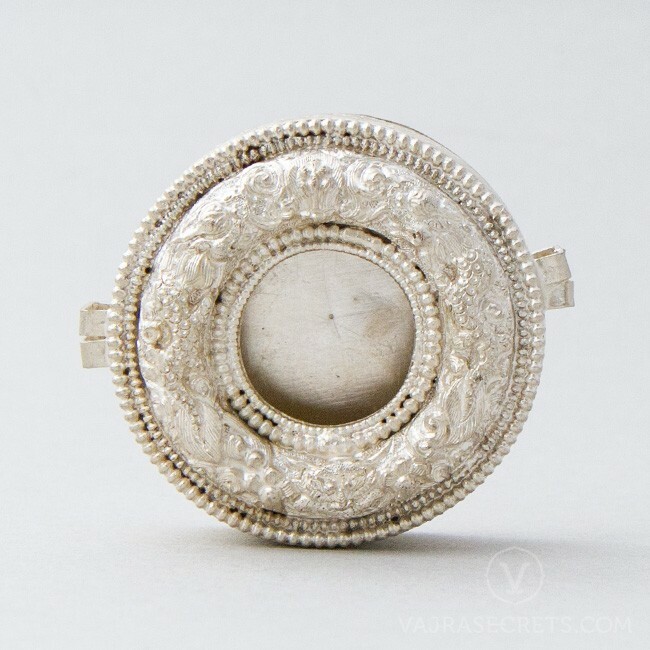 This circular Tibetan gau is handcrafted from white metal and silver-plated by master Himalayan craftsmen. Richly carved with ornate traditional motifs, this gau also features a window that allows the items contained within to be viewed. 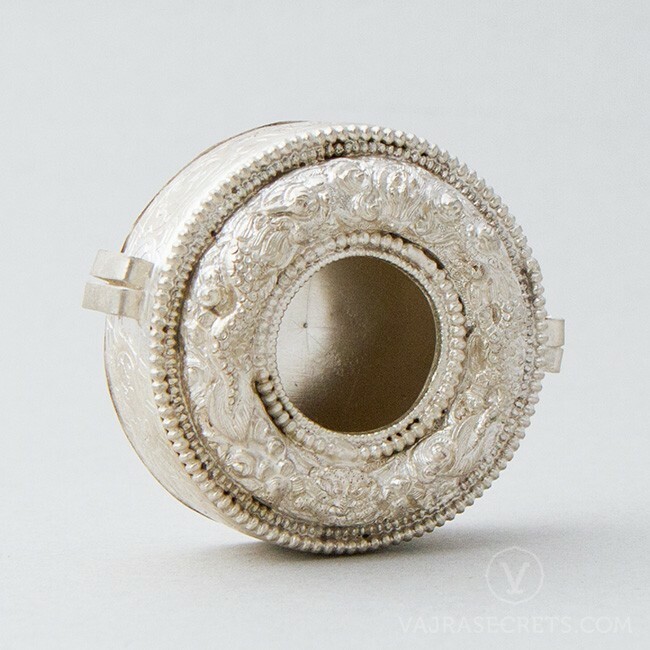 This compact fitted-back gau can be filled with small statues, tsa tsas, deity images, holy items or blessed objects, and used as a portable shrine, protective talisman or placed on your altar. Hold the front and back edges of the gau firmly and slide the two halves apart. Fill the gau with the items of your choice. Traditionally, the gau is lined with yellow silk to protect the items within and to secure them in place. Foam or other materials can also be inserted to ensure the items inside the gau do not move about. Optional: Fit a piece of glass at the underside of the window to protect the items within. Close the gau by sliding the friction-fit halves back into place. Ensure the gau remains shut by looping string or cord through the metal loops on both sides of the gau and securing them at the back.